Hotels-New-Zealand is a group of independently owned and non-related hotels, motels and serviced apartments providing accommodation located across Wellington New Zealand. Hotels New Zealand allows you to deal directly with the hotels giving you the best possible rates for these Wellington hotels. Book your accommodation online directly with the hotels in Wellington and save !!! Positioned at the heart of Wellington's commercial and retail districts the James Cook Hotel Grand Chancellor is a great place to stay in the heart of the New Zealand capital. The well appointed accommodation rooms and suites at Wellington's leading mid-market hotel provides both business and leisure travellers with friendly and professional service as well as wonderful guest facilities which includes 24 hour room service, concierge and reception, covered car parking, Bodyhaven spa style boutique and a complimentary in-house gymnasium. At the James Cook Grand Chancellor Hotel Wellington guests can also enjoy the Sojourn Cafe Bar with its innovative cuisine and contemporary ambience as well as the Whitby's Restaurant & Bar with its delicious local and international cuisine. This luxury Wellington accommodation is close to all of the local tourist and business attractions that Wellington jas to offer and has fantastic discount rates available online. The Quest Atrium Apartments in Wellington offers convienent and cost effective apartment accomodation in the Wellington central city ideal for leisure and corporate guests. It provides luxury self contained serviced apartments at a fantastic location in the heart of the Wellington Central Business District. The Quest Atrium features 60 apartments ranging from studios right through to 1, 2 & 3 bedroom self contained apartments. These Wellington serviced apartments are within easy access of Lambton Quay, Parliament House, great shopping, cafes, restaurants, theatres, Te Papa Museum, Victoria University, Westpac Stadium and the Botanical Gardens. Each serviced apartment is spacious, modern and non smokingi, featuring all of the facilities that a corporate or leisure traveler would need to make you feel at home. The Quest Atrium Wellington offers a range of guest facilities including a fully equipped fitness centre, spa, sauna, steam room, indoor heated lap pool, dry cleaning service, restaurant chargeback, secure undercover parking, lift, cot hire, tour desk and wireless broadband internet available in every apartment. Located in historic Thorndon, close to bus, train and ferry terminals and only a 5 minute walk from Westpac Stadium, New Zealand Parliament and the Wellington CBD. The hotel also has great motorway access. All of the 108 accommodation rooms feature ensuite bathrooms, tea & coffee making facilities, Sky TV, ironing facilities and wonderful city views. We offer accessible hotel rooms, interconnecting hotel rooms, family hotel rooms and a smoking floor. At The Thorndon Hotel Wellington by Rydges there is a 24 hour reception, 7 day a week licensed restaurant and bar facility, 42" plasma screen in the bar, 50 free car parks and free access to Bodyworks Gym. There is also a computer workstation in the foyer for guest use, cafenet (wireless internet access) installed on the first and ground floors. The Kingsgate hotel's new conference centre offers 5 conference rooms and can seat up to 200 people. All conference rooms feature natural light, air-conditioning, hush glass, soundproof interconnecting doors and new decor. We have a range of equipment available and offer a full catering service for all conferences including themed dinners and discount accommodation. The Thorndon Hotel Wellington by Rydges is the closest hotel to the Westpac Stadium, which makes it the ideal discount hotel accommodation for both corporate and leisure guests. The Silveroaks Hotel on Thorndon is perfectly located in the hitoric suburb of Thorndon, on the edge of the Wellington city centre. It is also positioned directly opposite the Wellington Botanical Gardens, from where you can catch the cable car to the heart of the Wellington business disctrict and the main shopping centres of the city. This discount Wellington accommodation is also just 1 kilometre from the New Zealand Parliament and Premier House, as well as being within walking distance to restaurants and cafes. The hotel rooms at the Silver Oaks Hotel on Thorndon feature a queen bedding and SKY TV, with a picturesque view over the Botanical Gardens or city. The hotel facilities at this accommodation in Wellington include the Rose Room restaurant, lounge bar and five conference rooms. The Grand Mercure Central City Apartment Hotel is centrally located in the heart of the Wellington CBD, only a few minutes walk to the city's best restaurants, shops, entertainment and nightlife. This affordable Wellington accommodation is a short stroll away from the famous Wellington Harbour, Te Papa National Museum, The Terrace, Lambton Quay, Courtenay Place and the main tourist attractions in the heart of the city centre. This uniquely Wellington central city location is perfect for both business and leisure travellers with 54 spacious budget hotel rooms and apartments spread out over 16 floors. Each guest accommodation room and apartment is well-appointed, non smoking, modern, with abundant natural light and personal service. Grand Mercure Wellington Central City Apartments offers a range of guest facilities including 24 hour reception, car parking, luggage storage, guest laundry, dry cleaning service, breakfast room service, wireless broadband internet, tour desk and lift. The Grand Mercure Central City Apartments Wellington is the ideal location for business and leisure at an unbeatable price. The Mecure Wellington Abel Tasman Hotel is a centrally located hotel right in the heart of the beautifil city of Wellington. This Wellington accommodation is a great choice for those who want to combine business with leisure, in a relaxed way. What guests will love about the Mecure Wellington Abel Tasman Hotel is the warmth and personal service and the fact that it is close to everything that the city has to offer. It also has numerous guests facilities and services including lounge bar, conference centre, direct internet access, faxing facilities, guest laundry, gym & fitness equipment, lift, restaurant, room service, secretarial services, tour desk, 24 hour reception and daily housekeeping. 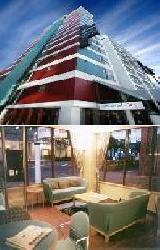 Located in the heart of the Wellington's CBD, the Abel Tasman Hotel offers quality accommodation at a reasonable price. The modern and friendlt Nomads Capital Backpackers in Wellington is the trendiest and hottest budget backpackers hostel available. It is centrally located right in the heart of the Wellington city centre and provides all types of travellers with discount accommodation in Wellington. It also features a wide range of modern amenities and services such as lounge bar, direct internet access, disabled facilities, faxing facilities, guest laundry, lift, restaurant, bbq facilities, security access and even a 24 hour reception. Further facilities and services to make your trip enjoyable and hassle free include tour & travel desk, 24hr internet, wheelchair friendly rooms, guest message service, common room, key card access, private courtyard & entertaining area, card phones, TV lounge, communal kitchen, airport transfers, bicycle parking, board games, book exchange, free city maps, hairdryers for hire, commual bathroom with hot showers, jobs board, lockers, luggage storage, pool table and vending machines. The Base Backpacker Hostel in Wellington is perfectly positioned in the heart of the Wellington entertainment district, which ensures that it is close to everything that the city has to offer. The property also includes numerous guest facilities and services such as a lounge bar, direct internet access, disabled facilities, faxing facilities, guest laundry, lift, tour desk, 24 hour reception, daily housekeeping, 24 hour security, outdoor terraced area, pool table, luggage storage, postal service, central heating, jobs board, free DVD library, airport transfers, internet cafe, car and bike parking. With the city on your doorstep and excellent guest facilities the Base Backpackers Wellington is the ideal place to stay for those people travelling on a budget. The 747 Motel provides quality Wellington accommodation only 3 kms to the Wellington international airport. All of the discount hotel rooms have modern decor and feature private bathroom facilities, Saturn Cable TV, electric blankets, continental breakfast, off-street car parking and complimentary morning paper. The 747 Motel is suitable for overnight transfers or longer term accommodation in Wellington. The 747 Motel is close to hospitals, sporting venues, Olympic pool, gym, licensed restaurants, shopping mall and 7kms from the InterIsland Ferry Terminal. This discount Wellington accommodation is a small complex situated in a quiet cul-de-sac in Kilbirnie, nestled between bush covered hills and the sea and only 10 minutes drive from the city centre. The Marksman Motor Inn has a central CBD location adjacent to Basin Reserve and 10 minutes walk to Courtenay Place and all of the major Wellington tourist attractions. This quality Wellington accommodation has a range of motel rooms available that have been tastefully decorated to suit your every need. The rooms at the Marksman Motor Inn including studio, one and two bedroom family units that are serviced daily for your convenience. This Wellington accommodation also features a guest laundry, free off-street carparking and is on a direct route to the airport and ferry terminals. 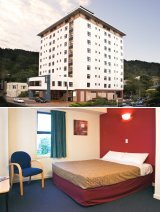 The Southgate Motor Inn provides luxury Wellington accommodation suites over 3 levels with lift access and daily servicing. All of the hotel suites feature a fully equipped kitchen, ensuite, hair dryer, super-king size beds, wireless internet, Sky TV, ironing facilities, room service, video, CD and DVD player. The Southgate Motor Inn is affordable, luxurious and adds another dimension of style and sophistication to the Wellington accommodation scene. The property is ideally situated opposite Wellington Hospital and set back from the road to reduce noise and also capture the sun all day long. This wonderful New Zealand motels has accommodation in 20 luxury suites offering the discerning traveller clean quality accommodation. This Wellington property has accomodation in 9 studio units (sleep 1-2). King-size or twin bed, workstation, kitchen and microwave. Ensuite with shower. 8 x 1-bedroom suites (sleep 2-4). King-size bed. Double sofa bed. Kitchen with microwave and cook hob. Ensuite with double spa bath/shower. 3 x 2-bedroom suites (sleep 4-6). King-size or twin beds. Double sofa bed. Kitchen with microwave and cook hob. Ensuite with double spa bath and separate shower, 2 access units. All the motel suites have modem connections, VCR/DVD hire, fridge, mini-bar, iron and ironing board, electric blankets, hairdryer and heated towel rail.. Situated in the trendy Cuba quarter of central Wellington, Hotel Willis is a centrally located, family run hotel offering quality discount accommodation and friendly service for those people looking for ideas to save money whilst staying in Wellington. The accommodation bright and spacious with private bathroom, TV/Sky TV, phone and tea/coffee-making facilities. The cafe/bar/restaurant is friendly and serves delicious light meals and snacks, open 7 days. Leave your car in our free off-street parking and explore Wellington on foot, just a short walk to the city attractions or hop on the bus that runs right past the hotel. We look forward to welcoming you to Hotel Willis. Situated in the centre of Wellington. Direct route from airport to city and motorway north. Capital of New Zealand. Gateway to the North and South Islands. The motel has accommodation for 19 studio, 1 and 2-bedroom suites, all with queen-size beds, Sky TV, alarm/radio, electric blankets, hairdryer, iron and ironing board.. Newly renovated, closest hostel to city centre. Relaxed atmosphere, piano. Friendly helpful staff. Free email, warm duvets on all beds. Free cereals, tea, coffee and chocolate drinks. Wed night: winter/soup, summer/sausage sizzle. Tent sites. Welcome to our motel on the Kapiti Coast. 2 minutes to beach and park. Conference room with balcony and sea views. Highspeed wireless Internt access in each accommodation room with Internet computer available in office. BYO and licensed restaurant on site. Short walk to golf course. 40 minutes to Interisland Ferry. Restaurants, bars, airport, boating, sky diving close by. Short drive to Southwards Car Museum, gardens, potters, bird sanctuary and butterfly farm. Visit us, visit paradise. Ocean Motel is ideal for the holiday-maker who is looking for peace and quiet away from the city rush, but close enough to spend the day in the capital city, Wellington. Shopping or sightseeing, it's only a 45-minute drive along the coast to/from the Interislander and Lynx ferry at the port of Wellington. A truly tranquil setting in park-like grounds, close to beach, restaurants, shops, international golf course and less than 1 hour to Wellington, stadium and Te Papa. We have a great range of shopping tips to the nearby boutique shopping. The motel contain accommodation for 3 self contained family villas, wheelchair accessible (international standards) and 6 studio units. Pets by arrangement. Courtesy car, cooked/continental breakfasts available. Opened December 2002, Ascot Motor Lodge has accommodation for 16 superior units , studio and 1 & 2-bedroom units, all with kitchen facilities and some with spa baths. 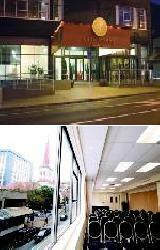 Situated opposite Wellington hospital, on the fringe of Wellington City. Easy access to airport, ferry terminal and motorway and on the city bus route. The hotel is also near to private hospital and hospice. Undercover carparking. Complex under video security. In-room Wireless Broadband Internet available. Victoria Court is Situated in downtown Wellington within easy walking distance to theatres, shopping, bars, Te Papa Museum of New Zealand, the polytechnic and the famous Cuba Street cafe scene. 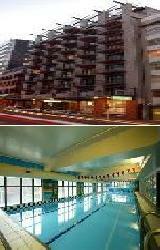 The complex opened in July 1999 and offers superior accommodation in studio, 1 and 2-bedroom apartments. Baths/showers, cook tops, queen-size beds and Sky TV. Breakfast is available on request, or you may wish to stroll to a local cafe - the choice is yours. 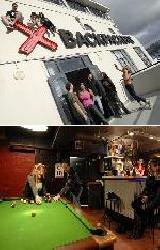 Welcome to Wellington's best backpackers/budget accommodation. BBH rating 72%. This is what our guests say about us: "Wow - what a place. This is the best I've stayed at in NZ" - Peter (UK). "The staff are welcoming and really cared about us" - Kim (London). "The free stuff was magic, Internet, wine, tea, coffee, breakfast, phone. I've not seen that anywhere" - Ryan (Ireland). "The first place we've found that is really busy in the winter. That says it all" - Jim and Cecily. Aotea Lodge, features accommodation for 37 motel units, licensed restaurant, heated indoor pool and spa. Located alongside the Royal New Zealand Police College, 200m off State Highway 1. Situated in rural setting overlooking Aotea Lagoon and Porirua Harbour, 2km to Porirua shops and station, 15 minutes or 20km to central Wellington or interisland ferry and 20 minutes to Hutt Valley. Local attractions: Historic Gear Homestead, RNZPC Museum, North City Plaza, Mega Centre, Porirua Museum and Pataka, Pauatauanui Wildlife Domain. Attractions within the region: Te Papa Museum, Westpac Stadium, Kapiti beaches and Southward Car Museum. "It is just like home." Capital Gateway Motor Lodge has accommodation for up to 140 guests and offers studio, 1-bedroom and 2-bedroom units. Some of the motel accommodation units have self-catering kitchens with fridge, sink, hot plates and a microwave. The executive 1-bedroom units have luxurious spa baths. We pride ourselves on our clean, tidy accommodation and friendly staff who strive to make your stay memorable and hassle-free. Accommodation units are serviced daily. 5 minutes to ferry. Restaurant & bar and 3 conference rooms. NEW CAMPERVAN PARK NOW OPEN! Welcome to our motel on the Kapiti Coast. 2 minutes to beach and park. Conference room with balcony and sea views. Highspeed wireless Internt access in each room with Internet computer available in office. BYO and licensed restaurant on site. Short walk to golf course. 40 minutes to Interisland Ferry. Restaurants, bars, airport, boating, sky diving close by. Short drive to Southwards Car Museum, gardens, potters, bird sanctuary and butterfly farm. Visit us, visit paradise. A newly restored heritage building popular for its value accommodation in the capital city centre, sympathetically restored decor, hard-to-match prices. You can save time by walking everywhere. Within 500m we have three cinema complexes, countless bars and restaurants, main bus routes, a supermarket and Te Papa Tongarewa (our museum). Reception open 24 hours. Centre Yourself In The City! At Terrace Heights we offer you premier accommodation in the heart of Wellington. Select from stylish studio, 1, 2 or 3-bedroom apartments. All apartments feature full kitchen, laundry, telephone, Sky TV, Internet access. On-site secure car parking available. Terrace Heights is ideal for the corporate traveller or for a leisurely extended stay. Whether it be relaxing in our sauna or swimming pool, perhaps you prefer a workout in our fully equipped gymnasium or simply enjoy a coffee in Cube Cafe located on the ground floor. Opened July 2003. Welcome to the last word in superior corporate accommodation. The motel is the closest accommodation to both the domestic and international airports, 650m from the terminal and ideally suited to passengers arriving in or departing from Wellington. Freephone from Wellington airport. Soundproof units. King, queen-size or single beds, spa baths, mini-bars, Sky TV, internal lift and air-conditioning. Car storage when available. Open for that late night or early morning arrival/departure with a courtesy shuttle to and from the airports. Stunning views over Wellington city and harbour, offering an ideal accommodation for business or pleasure. Superior 21 studio and 1-bedroom apartments, all with ensuites and kitchens. Guest laundry, off-street parking, lift to all floors. Long-term rates on application. Strategically located close to the motorway and The Terrace. Outstanding, quiet accommodation, licensed restaurant and conference centre. 17 tastefully decorated and comfortable self-contained units comprising 15 studios (sleep 3) and 2 family units (sleep 5-6). All units are serviced daily and have microwave, Sky TV, Saturn TV (cable - 30 channels), telephone. Facsimile and photocopier available in office. Beds with electric blankets, heaters, complimentary morning paper, cooked/continental breakfast available, room service meals (by arrangement only), guest laundry, same-day drycleaning and laundry service, safe off-street parking. Restaurant open by arrangement on Monday - Thursday only. 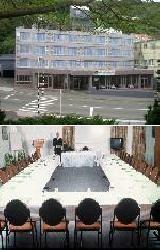 Conference facilities for up to 80 people. Accommodation in the heart of Wellington. Central to airport, railway station, interisland ferry, overseas terminal. 35 units. Closest motel to Te Papa museum. 36 accommodation units - 11 x 1 and 2-bedroom studio and family units, full kitchen facilities (4 with spa bath). 6 luxury lodge rooms (4 with spa bath). 4-star Qualmark rated Motel. Non-smoking. 18 budget hotel rooms with attached bathroom, coffee/tea-making facilities, phone, heating, Sky TV, access facilities. Continental breakfast, guest laundry, limited off-street parking. Full surveillance system. Cot/highchair available. Situated in city centre and close to Te Papa Museum and Basin Reserve. Stroll to Courtenay Place restaurants, cafes, theatres and waterfront. This is the perfect location to experience Wellington. FORMERLY ABEL TASMAN HOTEL. Newly refurbished accommodation hotel in the heart of the Wellington CBD. Shops, restaurants, bars, cafes, theatres and night clubs are all within an easy 10 minutes stroll. Close to the university, Te Papa, Railway station and 5 minutes to the ferry terminal and Wellington airport. Southgate Motor Inn - affordable and luxurious accommodation - adding another dimension of style and sophistication to Wellington's accommodation scene. Situated opposite Wellington Hospital and set back from the road to capture all-day sun, this unique complex offers 19 fully equipped spacious suites with balconies, full video surveillance system, conference room, lift, roof-top garden, spa pool and some undercover parking. Opened September 2003. Spacious, quiet 2-bedroom apartments accommodation - all with spa bath or double shower, king-size beds, large lounge - DVD player, full kitchen and laundry. Private patios. Heated swimming pool and spa. BBQ. Close to beach (sea views) and village shops. Paraparaumu Golf Course and Coastlands Mall nearby. Enjoy the accommodation and convenience of one of 23 studios, 2 x 1-bedroom units, and 1 x 3-bedroom apartment. Locate yourself in the heart of the stylish, cultural, and corporate harbour city. Undercover parking offers easy secure access to your room - so much more convenient. You will be close to Wellington CBD, exciting Cuba Street, cafes, bars, shopping, theatres, Te Papa, the Michael Fowler Centre, and universities - all within walking distance. Off-street parking. Within easy walking distance of local restaurants and Petone shopping and immediately adjacent to beach. 5 minutes to Hutt City, 10 minutes to Wellington CBD, Te Papa, the stadium and other leading attractions. 22 serviced non-smoking studio apartments (sleep 1-3), 2 family units (sleeps up to 6). Some with beautiful sea views across Wellington harbour. All accommodation include tea/coffee-making facilities, fridge, mini bar, shower, phone, Sky TV, electric blankets, heating, microwave, hairdryer, iron/ironing board. Full cooking facilities in some units. Cot/highchair available. Laundry facilities. Cooked/continental breakfast available. Extensive off-street car, boat, trailer and campervan parking. If you are considering a visit to Wellington then consider staying with us. Long-stay apartments from Dec 2005. Our aim is to make your stay in Wellington a pleasant one with affordable and comfortable hostel or camping accommodation. We have single, twin, double, triple and share-room budget accommodation located only minutes away from the city centre and entertainment precinct of Courtenay Place. Off-street parking and free daily courtesy shuttle to ferry. Groups welcome. 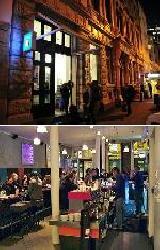 Newly renovated, closest hostel to Wellington city centre. Relaxed atmosphere, piano. Friendly helpful staff. Free email, comfortable accommodation with warm duvets on all beds. Free cereals, tea, coffee and chocolate drinks. Wed night: winter/soup, summer/sausage sizzle. Tent sites. Great weekly rates. Comfortable Wellington accommodation, affordable studios and 1-bedroom apartments. Conveniently situated to Wellington city centre, Wellington airport, interisland ferries, Westpac Stadium and Te Papa Museum. Walking distance to Wellington Hospital, Southern Cross & Wakefield Hospitals, Dance & Drama School, Massey University and Government House. On city bus route. Units serviced daily, non-smoking. Breakfast available. rate/minimum booking period may apply. Hosts: Irene & Rod Bayly. CityLife Wellington - A Heritage Hotel is a modern all-suite hotel located in the heart of New Zealand's Capital city. Close to Parliament Buildings, retail shopping, waterfront, entertainment, Te Papa (Museum of New Zealand), cafes and restaurants, the hotel is in the centre of the Wellington CBD, providing an ideal base for business or pleasure. Generous-size fully equipped suites give you the ultimate in choice and style of accommodation, matched with our very personalised service. 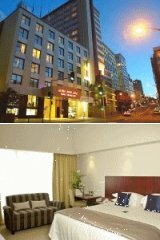 New hotel in central Wellington providing exceptional accommodation. Sky TV, radio alarm clock, mini bar, tea/coffee-making facilities. Fridge, Broadband Internet access, work desk, hairdryer, heating and direct dial STD/ISD telephones. Special access rooms, double, twin and twin/single room configurations, security key-card locks. Hotel services and facilities: Eclipse restaurant/bar/cafe serving food from very early to very late. Secure car parking, 24 hour reception. Broadband Internet in public areas and restaurant. Same day laundry and dry-cleaning service. Lift access (6 floors). Non-smoking floors, security key-card building access. You'll be impressed by the warm, welcoming service and the spacious, stylish feel of Brentwood Hotel. We provide classic lodge-style accommodation with all the features and comforts you would expect from a quality city hotel. Whether visiting Wellington for a conference, a stopover, or a business trip, Brentwood Hotel makes your stay easy. Regular shuttles take you to and from the airport, just minutes away. We provide ample parking for guests travelling by car and friendly staff that can provides you with tips for travelling around the city. Beautiful seaside hostel - glorious views of Kapiti & South Islands. Accommodation : 21 rooms - 8 single, 5 double, 4 twin, 2 treble, 2 dorms. Kitchen, TV lounge. All rooms (not dorms) with handbasins, electric blankets, blankets, sheets and heaters. Copthorne Hotel Wellington Plimmer Towers is at the very heart of Wellington. Suites and hotel rooms offer city and harbour views for guests to relax and revive whilst planning how to make the most of easy access to the finest shopping, cultural, arts, eating and entertainment experiences the capital has to offer. Just a minute off the motorway, car parking is available and makes Copthorne Hotel Wellington Plimmer Towers your easy accommodation choice. Serious relaxation at a great price! Special family and weekend-away rates available all year. Business or pleasure - whatever the reason for visiting the capital city, the Bella Vista Motel can fulfil your accommodation requirements. A great location with 16 superior units and 1 x 4-bedroom luxury apartment in close proximity to the central city, airport and ferry terminals at beautiful Evans Bay. Ample well-lit off-street parking for guests. The waterfront is full of restaurants, cafes, shops, galleries and, most famously Te Papa, the Museum of New Zealand. The city hosts various performing arts, festivals, international and national sporting events and conferences. We look forward to welcoming you on your arrival! The Glen Alton Motel. It is situated in a peaceful suburban location, 10 minutes from central Wellington and all the major attractions, including Te Papa, Wellington Westpac Stadium, and the Interisland Ferry Terminal. Minutes from Johnsonville township which offers an extensive variety of shops and amenities. Ideal for people on transfer, large groups and families. We offer accommodation for 18 ground-floor spacious units, serviced daily and there is ample off-street parking. Cooked/continental breakfast available. You won't find a better location to enjoy city living in a suburban environment. Situated just five minutes walk to the Wellington city centre and within a ten minute drive and on the shuttle route to the airport, rail, bus and interisland ferry terminal. Richmond Guest House is just fifteen walk to the Tepapa museum and only a five minute walk to the base of beautiful Mt Victoria, from where another thirty minute walk will take you to the top from where you will get arguably some of the best scenic views of a city in the world all 360 degrees. Clean and comfortable Wellington accommodation at a very affordable price. Richmond Guest House have single rooms, double and twin rooms and triple rooms with all rooms having there own ensuite bathrooms, a guests' kitchen and dining room where complimentary tea, coffee and chocolate is always available. There is also a television lounge with Sky TV, laundry, guest telephone and Free Internet access including wireless Internet. Richmond Guest House is Your Home Away From Home in Wellington, New Zealand. Wellington Kingsgate Hotel Oriental Bay welcomes you to our waterfront locality that is truly a window on Wellington. All the hotel 116 rooms offer accommodation with harbour or city views. Not only is Wellington the seat of Government, packed with national treasures and restored cultural centres, it is also a vibrant, cosmopolitan and sophisticated city. Kingsgate hotel Wellington preferred location spoils you for choice of ultimate day and night activities on where you can eat, shop, play and party. Only 2-minute walk to Te Papa Museum, the vibrant Courtney Place and local theatre. On your return to the hotel you can relax and enjoy our facilities including restaurant and bar and an indoor heated swimming pool. Family rooms with special weekend, holiday and family rates. Superb Lambton CBD location, only minutes from Wellington Westpac Stadium, Queens Wharf Events Centre, ferry terminals, Te Papa, shopping, bars, cafes, restaurants and entertainment. Accommodation for 72 studio, 1, 2 and 3-bedroom fully serviced apartments. Kitchen/laundry, and all the comforts of home including Sky TV. Gym and conference room on site. Competitive rates with holiday and weekend specials. Corporate and long-stay rates available. Bookings essential. Most tariffs include in-room continental breakfast. Welcome to Wellington Riddiford Hotel. Here you can enjoy all the features that Riddiford hotel offers situated right in the heart of Hutt City. Within walking distance to Wellington's most popular shopping mall, the Westfield Queensgate shopping mall, cinema complex, and the Dowse Art Museum. 3 minutes to Hutt Hospital, 12 minutes to the Interisland ferry and 15 minutes to the Westpac Stadium and downtown Wellington City. 22 accommodation guest rooms all with Sky channels, mini-bar, iron & ironing board, broadband Internet connection, complimentary tea and coffee-making facilities. One of the best fully licensed Chinese restaurants in the Wellington area, which can cater for up to 120 people. A conference room that accommodates up to 30 people theatre-style and 15 people boardroom-style. We also provide central heating and air-conditioning throughout the building. Same-day dry cleaning service. Newtown's Best Value for long-term accommodation ! Convenient location on the fringe of the Wellington CBD, comfortable lounge and dining, free tea/coffee, table tennis, pool tables, central heating, relaxing grounds and summer BBQs. 9 new studio units. Microwaves in kitchens, corner spa bath, data port. Central to restaurants, Te Papa, the zoo, Basin Reserve, sports stadium, Massey University, Southern Cross and Wellington Hospitals. Located 600m from central Upper Hutt. Adjacent to dairy, grocery, pharmacy, bakery etc. Short stroll to restaurants (charge-back facility for corporates). Close to Trentham racecourse, leisure centre, 4 golf courses, army camp, railway station. 22 minutes to Interisland ferry terminal, WestpacTrust Stadium. 25 minutes from Te Papa. Spacious accommodation :- studio, 1 and 2-bedroom units. Fully refurbished. All units include fully equipped kitchens, hairdryer and ironing facilities. Spa bath units available. Executive suites (underfloor bathroom heating and in-room VCR). Room service cooked/continental breakfast. Business facilities. Guest laundry, BBQ, swimming and spa pools. Experience comfort and style at Fernhill Motor Lodge. You will be warmly welcomed by our friendly staff and shown to your spacious room. Sink into the comfort of your lounge chair. Refresh yourself in a continuous hot water, high-pressure shower, or in one of the hotel spa baths, sure to leave you rejuvenated. Enjoy a fabulous meal from a la carte menu in the comfort of your accommodation or in our licensed restaurant. Drift off to sleep in one of the new Sleepyhead Posturepeadic beds, leaving you refreshed to face a new day. Facilities available include on-site parking for large vehicles and trailers, well-appointed conference facilities, licensed restaurant, bar and an internal atrium for "somewhere to go". We are located 2 minutes to Lower Hutt City, 5 minutes to Lower Hutt Hospital, a 10-minute drive to stadium and ferry terminal. Handy to gym, swimming pool, town hall and several golf courses. Long-stays a speciality. If peace and tranquillity are important to you, then you won't find a better location than Bristol Motel, literally 5 minutes to Trentham Race Course, Trentham Army Camp and Upper Hutt City. The motel is only 30 minutes away from Wellington and with the interisland ferry terminal and railway station so close it makes us the ideal location to leave your car at the motel and take the train to Wellington city or the Wairarapa. The motel has been completely refurbished and comprises accommodation for 4 twin/double units with tea and coffee-making facilities, 5 studio units all with kitchens (sleep up to 3), and 2 family units with shower, bath and full kitchen facilities (sleep up to 6). Ground-floor units, ample off-street parking, quiet garden setting. Abbeycourt Motel Wellington is owner-operated and has 7 spacious accommodation studio units (sleep 2-4). There is also a small conference/function room available for up to 12 people. This comfortable and affordable Wellington motel offers off-street parking and is located 3 minutes from Lower Hutt City, the hospital and an aquatic centre. Lower Hutt and nearby Petone have many restaurants offering a wide range of fare. Being 10 minutes from Wellington City makes this an ideal location for business, visiting Te Papa and the Westpac Stadium, or enjoying the many events Wellington has to offer. It is an ideal stopover for the Cook Strait ferry or for taking day trips to the south Island. The wineries, vineyards and gardens of the Wairarapa, the Staglands Wildlife Reserve, the Kapiti Coast and many local walks and trails are all within easy reach from Abbeycourt. The Quiet Motel - With The Latest For Noise Control. Wellington's latest motel. 22 accommodation units; studios, 1 and 2-bedroom apartments. Covered, off-street parking. Elevator to all units. Peace of Mind security. Tour desk, room service, cooked/continental breakfasts. Only a 2-minute stroll to restaurants, cafes and shopping mall, close to indoor swimming pool. 5 minutes to Interisland ferries and stadium. 7 minutes to Hutt Valley, Wellington, Te Papa. Located in the heart of Wellington shopping and business district, Quest Apartments Wellington features accommodation for luxury, studio, 1 Bedroom , and 2 bedroom apartments. Within easy walking distance from your front door are Wellington's cable car, Parliament, The Wellington Convention Centre and The Westpac Stadium. Quest Wellington Serviced Apartments provides the standard suite of Quest Services including Qantas frequent flyer points, breakfast packs, restaurant charge-back and pantry shopping. Overnight and long-stays welcome. No on-site parking sorry.